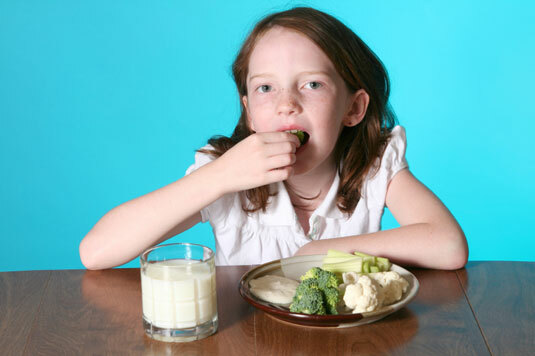 Children learn their eating habits at a very young age, age 2 or even younger. 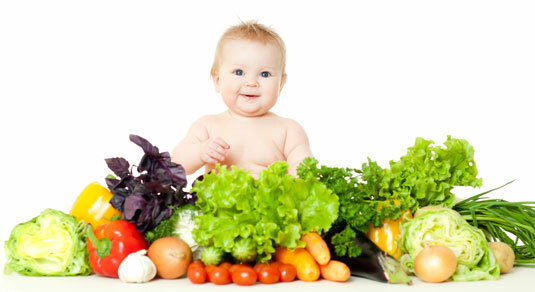 From the time they can eat solid or even semi-solid food, they should be given choices of vegetables. Don’t use bottled vegetables, since they are often filled with salt and sugar, but rather make the vegetables into small portions yourself. Give the child the vegetable to eat by itself, not with a choice of fatty things or sweet things that he will gravitate toward. Do not threaten that the “good stuff” comes only after the vegetables are eaten. Vegetables must be seen as part of the good stuff. And, of course, set an example. Let him see you eating and enjoying the vegetables. The message will come through loud and clear. Children love to feel that they have power. Give them the power to pick the vegetables in the market that they and you will eat. Move around to the different colors, explaining that the reason for the different colors is that each color represents a different kind of food that they need in their body. Get a rainbow of vegetables. Try to know what the vegetables contain so you can explain to the child. This vegetable gives you this vitamin and mineral. That vegetable gives you that one. Your body uses them all to create a healthy person. 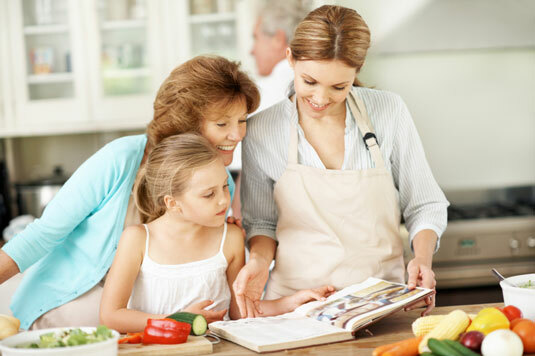 Involve children in food preparation. When you ask children to describe their earliest memories, they often talk happily about helping their grandmother make some kind of food. 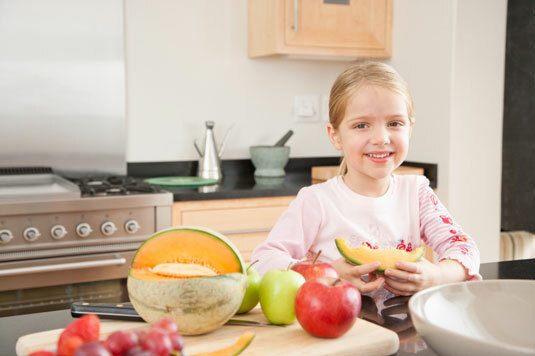 Preparing food together can be a great bonding experience between you and your child, and it also provides you with the opportunity to teach good nutrition. 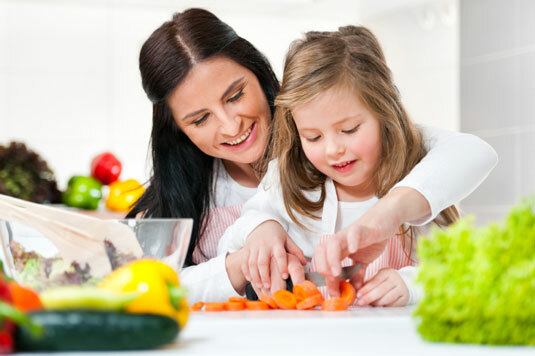 If your child helps you to prepare vegetables, he will want to try what he has prepared. Keep problem foods out of sight and good foods in easy view. If potato chips or creamy cookies sit on the kitchen counter, can you blame your child (or yourself) for grabbing a handful every time he or she goes by? Don’t buy these foods in the first place. If you do, keep them out of sight. You know what happens when you walk up to a buffet table. You can more easily avoid what you don’t see. On the other hand, keep fruits and vegetables in plain sight. Have carrot sticks and celery sticks easily available. Keep some cooked broccoli and cauliflower in the refrigerator. 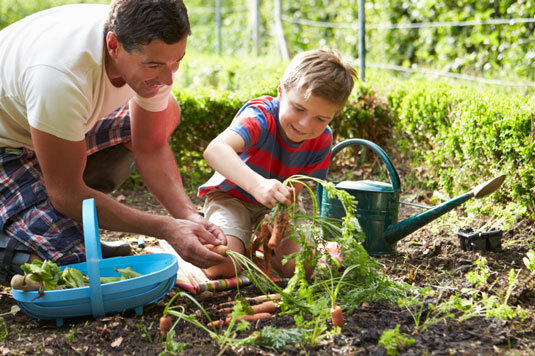 Even if all you have is a small box, you can show your child where vegetables come from, how they grow, when to pick them, and the fun of eating what you grow. Plus, foods that you grow and pick yourself, just at the peak of taste, are a totally different experience from what you get at the market. Only the farmer’s market can come close. So if you can’t possibly grow your own, take your child to a farmer’s market. They are everywhere. Let your child do the picking. The thrill of picking your own food is not to be missed. If you can’t pick in your own garden, pick where you can pay for the produce in another garden. Find vegetable recipes they like. In the age of the Internet, the availability of great recipes is almost overwhelming. Brilliant chefs are working to produce recipes that make you salivate. Your children will love the results. People with diabetes can eat great food. They can eat just about anything as long as the portions are appropriate. You don’t have to go to vegetarian sources to find great vegetable recipes. Even restaurants that feature meat know how to cook vegetables. You’ll be amazed at the creative ways that chefs prepare zucchini, carrots, squash, spinach, and so forth. Try watching some of the cooking shows on TV as you exercise. Check the schedule and try to exercise when the vegetable cooking is being shown. The only problem is that you may want to stop exercising and start cooking. Resist until you have done your 30 minutes or more. 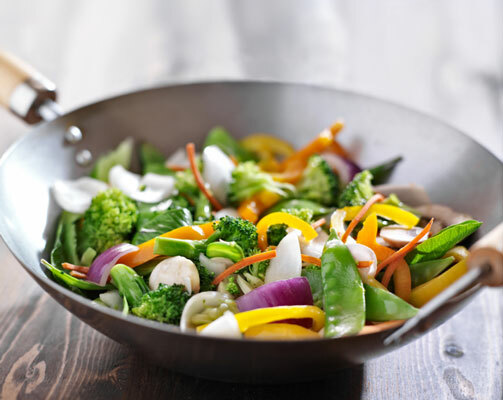 One of the best ways to cook vegetables ending with a delicious dish without adding a lot of fat is to stir-fry. You use very little oil and the vegetables come out hot and delicious. The natural tastes of the vegetables are sealed in. The Chinese have been doing it this way for generations. Until they adopted the Western styles of cooking and eating, diabetes was not much of a problem among the Chinese. Stir-fry many different kinds of vegetables together to make a vegetable medley. Some may take a little longer or a little shorter to fry so put the ones together that take the same time. A meal made up just with stir-fried vegetables can be all your child needs to realize how delicious vegetables can be. You don’t have to throw in any chicken or beef. That is an important message to send your child. A meal can be complete without animal protein. Eating vegetarian is a very healthful way to go. Sometimes dipping the vegetables into a delicious dip that you prepare can make the vegetables even more delicious, desirable, and easy to eat. A 2-year-old child requires a lot less than a 20-year old adult. The recommended serving size of vegetables for a toddler is a tablespoon per year of age. If you want to get your 2-year-old to eat five of his servings of vegetables, all you have to do is get him to eat ten tablespoons during the course of the day. That’s a lot easier than you thought. If your child wants more, don’t stop him! With so little that has to be eaten to reach the daily goal, it may be easier to stick to just one or two vegetables on any given day. Today is carrot and bean day while tomorrow is beet and zucchini day. Vegetables can be fun! You would never think of offering your child a cigarette, would you? Why would you ever offer your child a can of soda? If you want to get some more fruit into your child, and he won’t eat enough solid fruit, give him 100 percent fruit juice. You can get juice from just about any fruit and many vegetables. You can also make delicious fruit smoothies with lots of fruit, some juice, and a little yogurt. Kids love them!